Did the Steelers and Redskins Have a Deal Set on Draft Day? Just when it sounded like the Steelers were not as high on Florida guard Mike Pouncey as we all thought – this story hits the web. The story comes from Jim Wexell of Steel City Insider, who states that the Steelers and Redskins had a deal agreed upon during the 2011 NFL Draft that would’ve given the Steelers the 16th overall pick. The trade didn’t happen because the player the Steelers wanted was off the draft board. The player that the Steelers wanted? 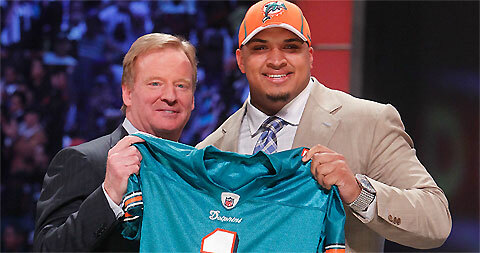 You guessed it -Mike Pouncey. He was drafted 15th by the Miami Dolphins. The Redskins eventually traded that 16th pick to Jacksonville, who drafted Missouri quarterback Blaine Gabbert. It’s likely the Steelers would’ve also given at least their 2nd-round pick to Washington. The Steelers stayed put after Pouncey was drafted, and ended up taking Ohio State DE Cameron Heyward in the 1st round and Florida OT Marcus Gilbert in the 2nd round.